These two were no strangers to each other. In fact, they new each other well…although the Sticker Buck probably didn’t know that, or at least he didn’t know how long their crazy lives were entwined. In fact, it was just 3 short years ago that Eliot let the Sticker Buck walk…and in this same point of brush, ironically. At the time, I couldn’t understand why my father would pass on such a nice buck, especially at the wolf range of 7 steps! Even then, the Sticker Buck displayed heavy main beams thick of bone, a genetic not so commonly seen, especially in a young deer. He was a nice, massive main frame 4X4. In my eyes he was a shooter….Dad simply explained that he needed to grow up. I suppose my pride wouldn’t let me admit at the time that I didn’t even bother to look at his body to judge his age. Heck, at that time, I didn’t really care. But that was the stage of the bowhunter’s life that I was at during that time. And Eliot, my Dad…well, he was at the stage of the bowhunter’s life that let young bucks walk, even if they were a dang good buck. As I write this, I realize that I understand that now, all these years later, knowing I am perhaps at that stage and have been for several years now. I also feel that many things happen for a reason…I look back now and I know that moment was one of them. The “Saga of the Sticker Buck” would fill an entire lengthy chapter in a book…but this is a blog and it’s already too darn long, so I guess you’ll have to wait until I write the book to hear it all (insert chuckle). But, in short, Eliot had a least two previous and separate encounters with ‘Ol Stickers (not counting the first encounter 3 years prior). Just last winter, Eliot found himself on the ground with the buck a few short steps from him…only offering Eliot an unethical shot. Shortly after that, with the last few hours of last season nearly a memory, Eliot passed on him out of a treestand because the buck was just a tad out of Eliot’s comfort range. I had an encounter with the buck that year as well…in September I had been hunting with Mossy Oak on the ground when the buck trotted by at 4 steps…I let down my draw and didn’t shoot because my camera man hadn’t started his camera soon enough (don’t insert chuckle). Looking back now, I’m glad I didn’t get a shot at that deer. My wife, Tara, had ‘Ol Stickers at 14 yards standing broadside and looking away from her treestand…but she didn’t shoot because I got buck f-f-f-f-fever and forgot my role in telling her when it was safe to shoot…it was her first bow hunt. You would have thought it was my first bow hunt. Bucks like the Sticker Buck have a tendency to do that to a person. 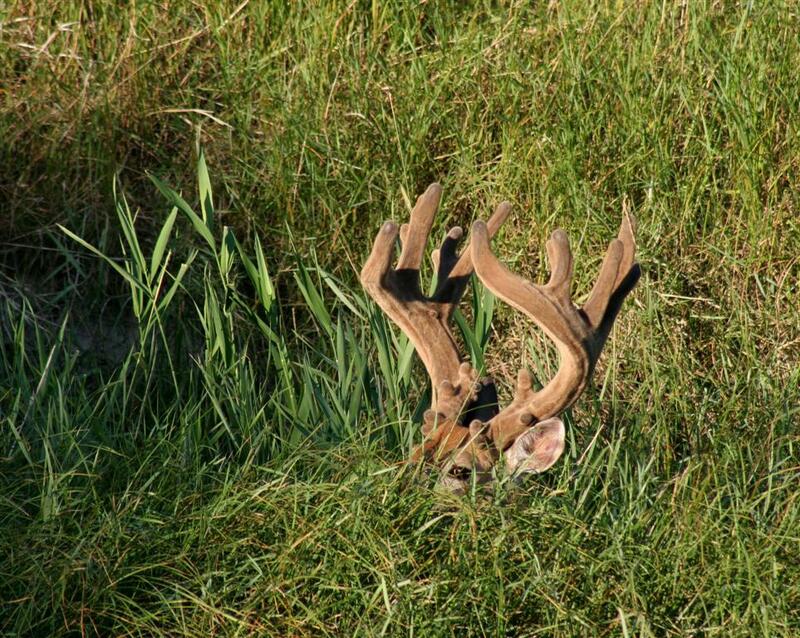 One hot July day I spotted an incredible mass of velvet-covered horns looming out of the tall grass on a riverbank…I recognized the buck as the Sticker Buck…I eased down to the river near the sleeping buck and snapped some photos…then I whistled at him to get his eyes open. When he spooked I got some neat photos of him bounding away. Then there’s the sheds…I found the shed from the first year Dad passed on the buck and two other sheds from separate years leading to the “set” that was on the bucks head when Eliot encountered him this last time. The last shed, shown here, was hung up in some willow branches on the riverbank…within one-hundred yards from where I snapped the photos of him in velvet…he was a homebody. 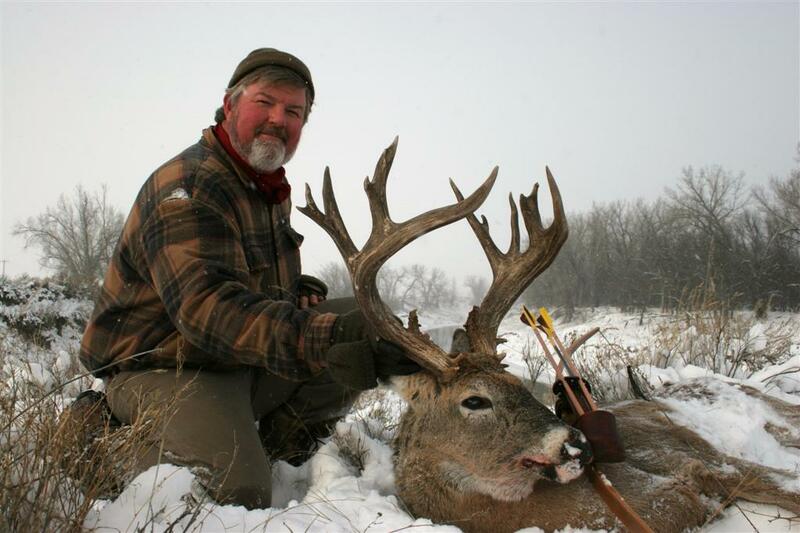 …the longbow’s limbs were already loaded…probably well past the 70+ lb draw as the big man stretched out…when the great buck entered the shooting lane. The old warrior buck did what old warrior bucks do…it felt Eliot’s presence…maybe it saw him draw, maybe it just knew. It stopped and looked at Eliot…but it was too late, the arrow was on it’s way. In the short amount of time it took the arrow to cover the 4 yards of Montana air between Eliot and the hair, the Sticker Buck’s primal reflex spun him in place and turned him away from Eliot. 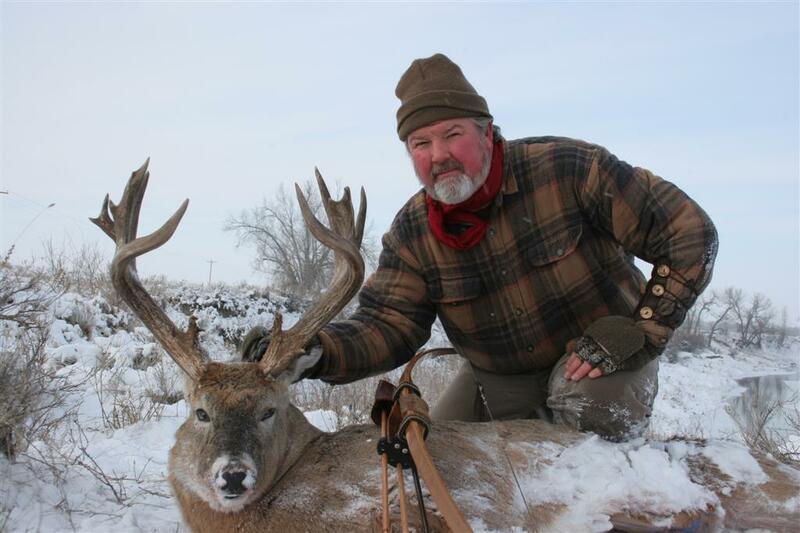 But it was too little and too late…the heavy cedar arrow and 150+ grain broadhead buried itself deep into the bucks vitals, stopping only when nearly through the opposite shoulder. The strong buck took off as fast as he could run, and Eliot lost sight of him. We all took up the blood trail together, finding most the arrow minus the broadhead, lots of blood, and a blood trail leading across a stubble field. 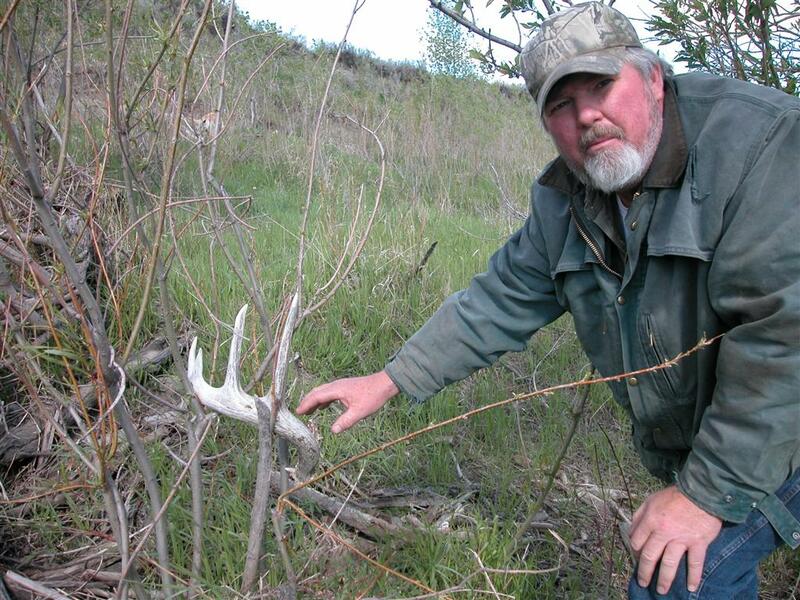 At times we had hunted this buck as a family, and we found him as a family. We had just enough time to take some group photos that evening. It snowed heavily overnight, making a nice contrast for a few great pictures the next day. In the background, you can see the river…and the exact log that the buck jumped over while I snapped the photo of him in velvet. Also, that was the point of timber that Dad had first encountered the buck, passing on him, and ultimately tagging him three years later. In all my years of guiding and bowhunting whitetail, the Sticker buck was hands-down the heaviest buck I ever helped hoist into a pickup. The Sticker Buck’s neatest character is his mass, with right around 50″, plus or minus, following the entire length of his long main beams and thick points. Eliot’s emotions were contagious upon finding the Sticker Buck and he’ll tell you today that the best part about the sticker buck, the part that makes him so special, is the story of his history, the encounters, and the final hunt and recovery being shared with family, thus completing a chapter in Eliot’s life, simply called “The Sticker Buck”. 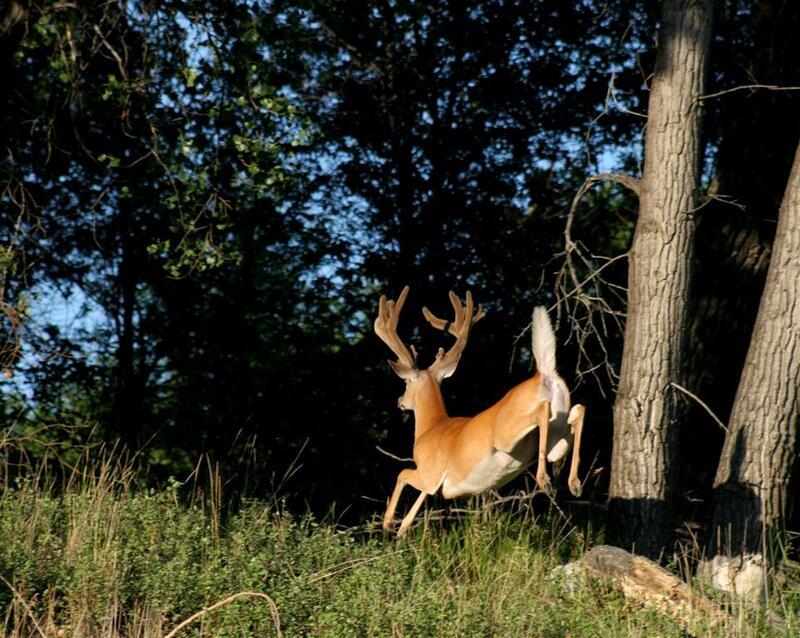 I have to agree….but he’s a pretty darn nice buck too. He is displayed with respect and pride in my Dad’s house where I grew up. My children will know the story, and maybe one day I can be a part of their special story. I’m hoping for a typical…not unlike the Hansen Buck (insert big chuckle). 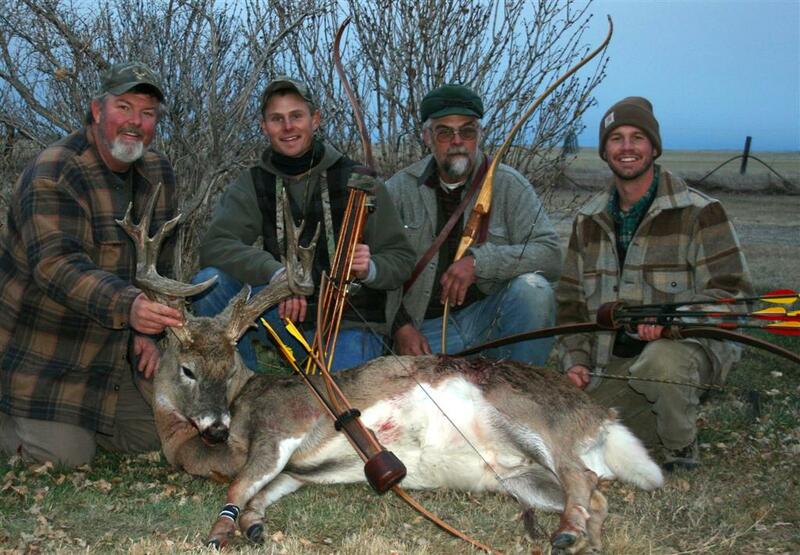 This entry was posted in Traditional Archery, Traditional Bow Hunting and tagged archery, archery hunting, bow hunting, bowhunting, bowhunting whitetails, buck, cedar arrows, longbow, Luke Strommen, Milk river, monster buck, nature, photography, rose city archery, traditional archery, traditional archery hunting, whitetail buck, wood arrows on July 3, 2015 by rosecityarchery. We are Rose City Archery the world’s largest wood arrow manufacturer, join us on a factory tour with Jerry Dishion Owner and CEO. All arrows are handmade from wood found here in Coquille Valley near Myrtle Point Oregon, we use %100 percent of the wood byproduct from the arrow making process. For more information about our other cedar products, arrow building supplies, arrow orders, FAQ’s, etc check out http://www.rosecityarchery.com. This entry was posted in archery artwork, Arrows, Arrows Archive, Jerry Dishion, Port Orford Cedar Arrows, Rose City Webisodes, Traditional Archery, Traditional Archery Hunting, Traditional Bow Hunting and tagged archery, archery hunting, archery tour, factory tour, rose city archery, traditional archery on March 29, 2015 by rosecityarchery.